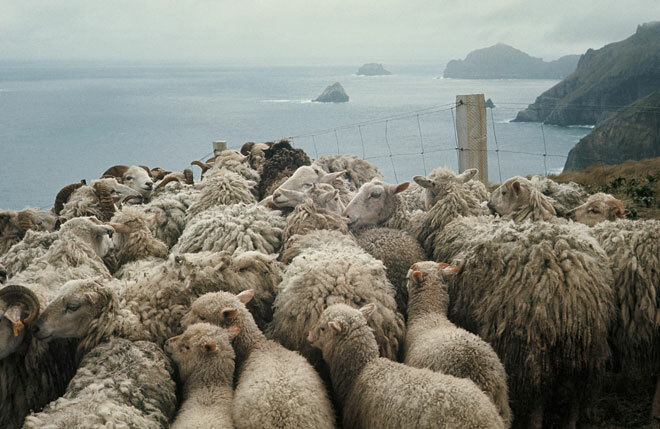 In 1931 sheep farming ceased on Campbell Island and the animals were left to fend for themselves. Concern about damage to plants led to the flock being fenced at one end of the island in 1970. In the summer of 1975–76 a group of scientists went to Campbell Island and collected 10 sheep to bring back to New Zealand as a rare breed. The animals in this photo are penned in against a fence during that operation. They had evolved resistance to footrot and a propensity to shed their fleeces. In 1980 the remaining sheep on Campbell Island, about 3,000 in number, were shot to allow the megaherbs to recover.